TCS provides the students the required state education, including a second language. In addition to the State required curriculum the students also take Christian Ethics. TCS provides the students the required state education in the Latvian language. Upon entering the 5th grade, students are required to choose a third language to study. In addition to the curriculum the students also are required to take Christian Ethics. TCS 9th grade students successfully pass the 9th grade state exams and graduate. Highschool education is not required in Latvia, but most students choose to continue their education after 9th grade. TCS offers a comprehensive curriculum to prepare students for the State Exams during their senior year. In addition to the state curriculum, the students also take Christian Ethics and continue their studies in the foreign languages chosen in primary school. TCS has consistently ranked in the TOP 10 schools in Latvia.. These rankings are determined by the State exam results in both 9th and 12th grade. TCS successfully competes in the scholastic competitions throughout the school year and has consistently been represented in Nationals for different subjects. In 2018 four student projects were selected for presentation in the National Conference. 95% of TCS 12th grade graduates choose to continue their education in a University. TCS graduates have a 100% acceptance rate and 70% of students receive full scholarships in schools offering scholarships. Talsi Christian School Foundation offers two deserving seniors full ride scholarships to a University every year. These students are chosen based on their Academic Accomplishments, their Christian character and Leadership involvement. 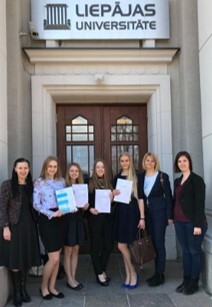 To date six TCS graduates have returned to TCS to become teachers after pursuing an Education degree at a University in Latvia, as well as the United States.